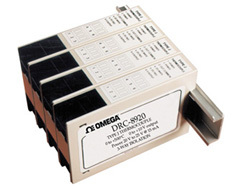 The DRC-8900 Series DIN rail mount signal conditioners are ideal for a wide range of process monitoring applications. Models are available for a many different input types including thermocouples, RTDs, and process voltage or current. All models isolate and linearize. The thermocouple input models also have cold junction compensation. These signal conditioners have three way isolation … input to output, input to power and output to power. All models are powered by 24 Vdc and are housed in a plastic case with a built-in DIN rail mounting foot. Connections are made to easily accessible screw terminals. 참고: All models are supplied with complete operator’s manual.